Spent a few days this week helping bump-in an exhibition that opened last night at Belconnen Arts Centre - a fabulous lakeside venue in Canberra's north. 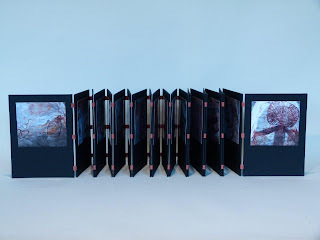 The exhibition is a mix of works by local bookbinders, book artists and calligraphers with the calligraphers taking the walls and the bookies the plinths. Two of my works are featured in the exhibition - Little Bit Long Way (left) and Tinted Undercoat Required. The latter was designed as a wall work and the bump-in was the first time I had seen it hanging. I must admit that it was a thrill to see that it worked as I had intended. For those who might be interested, Handwritten Handbound runs until 11 November. Thanks for letting me know about this Terence - I used to be a member of the CCS and Lyndell's book is one that she did for a project I co-ordinate "A Letter a Week" so I am feeling multi-connected! I'm sure it must look fabulous - any chance of more photos do you think?